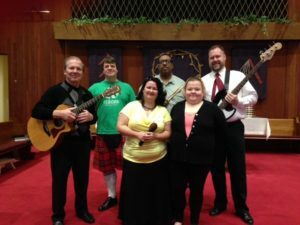 If you feel most connected to God in a casual environment that offers upbeat praise music, community prayer, visual arts and a message centered on the Word, you will be at home at the First Presbyterian Praise Worship Service. Our 9:00 a.m. Praise Worship Service is a multi-generational service for teens, young adults, adults and families with children. When you enter the sanctuary you will be greeted by a friendly face, handed a bulletin of the events of the day, and up and coming happenings in the future at the Church. Most people dress in jeans and t-shirt and others dress in their “Sunday Best.” Honestly, we just want you to be comfortable, so please come as you are. The service lasts approximately forty-five minutes to an hour, depending on the length of the sermon and if it is Communion Sunday. The music played is upbeat, inspiring and relevant, taken from today’s best Christian composers. Our excellent praise team leads worship with a band of drums, guitars, bass, keyboard and amazing vocals. The words are projected on a screen large enough for all to see using vibrant software enhancements to heighten the worship experience. We invite you to come and share with us the wonderful spirit of the Living God.